Hello everyone! I’ve been super busy this last fortnight, stitching, walking, reading, cleaning, running around after family members & I can’t wait to take a break! One highlight was a repeat dinner with the Harpur family, who brought Aurora with them. Two weeks ago she was the length of Simon’s forearm/hand – now look at her! She’s 5 weeks here. I didn’t post last week as my pieces were all over the show as I worked away at the various #schoolofmagicalstitchesandliterature tasks. All up, this last fortnight has seen the start & finish of Hello March (500 for words), 200+ more stitches on Nantucket Rose (enabled), 600+ on Shakespeare’s Fairies (various challenges) and 700+ on Tapestry Cat (two challenges). I have just stitched more on TC in a week than I did in all of 2018. He nearly has a tail! This is a lot of stitching but with our national holiday, Waitangi Day, I got extra walking and stitching in. And market shopping. Nom nom on the Whitestone cheeses and Selash cured meats. And perfection at the Franked stall – imported, handcrafted items from Cambodia where there is a story behind the item, & it’s helping differently abled people. I also finished my January Project Life pages. I’m choosing to do these in a 6*8 album as it’s more personal to me, not for the family. There’s some stuff that involves others (I asked Mase to fill in the Back to School card) but they won’t get this until I’m passed. Mase does look at it, but he knows if it’s hidden journaling, it’s private to me & he’s not to read it yet. And on Sunday, Louise & I got up early and walked around the harbour on Tamaki Drive. We started at St Helliers, went up to Achilles Point & watched the sunrise and a cruise ship come into the harbour, picked up coffee at Mission Bay and eventually got collected at Royal Akarana Yacht Club. 7.2km in all of super-quality time with my girl. January 6 – Introduce yourself, your projects, and any goals you have for the year! Well. 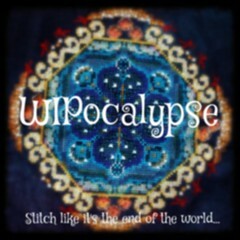 This is my fifth year of WIpocalypse. 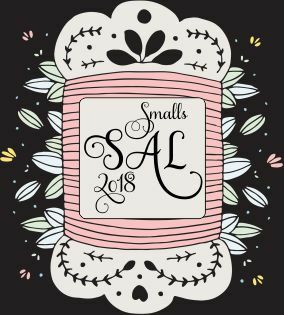 It’s the most committed I’ve been to any SAL & I put that down to the pressure free, encouraging environment that Melissa hosts. If you’re a crafter, please join up either on your blog or via the Facebook group – we welcome all enablers! If you’ve not read from my blog before, I’m in my mid-40’s, a working mum to four (ranging from 24-9) & partner. I am book-mad, often found stitching & listening to podcasts or audiobooks, and I wouldn’t mind winning Lotto so that I could stay home and stitch (but I’d have to remember to buy tickets first). We own our home near the base of Auckland’s Waitakere Ranges & can often be found working on it or a friends (my partner was an engineer, he’s bloody handy with a tool belt), walking on the beach or in one of the many beautiful parks Auckland boasts. I’ve been hand stitching since before I was 10, can’t knit an even scarf or crochet to save myself and don’t often pull my machine out (altho I brought a 1940’s Singer recently, purely on impulse as I love the look). I’m a whizz at curtains. Hopefully with returning to work/school/other crap I will still feel stitchy most nights & achieve all these goals. When I look back at my January post, I think “you plonker”. I was far too ambitious! Focus on a Finish – whatever needs completing from the above or a current WIP that is nearly there. Mermaids of the Deep will be high on that list. UH HUH, REALLY? FOCUS? While I got some new starts & finishes in 2017, most excitedly the Mirabilia Andromeda, I think that I will work on focus pieces for 2018, and dribble in the odd new start that I have kitted. I’ll ignore the SM & SFS themed SALs except where my focus piece matches the theme e.g. in the FB Teresa Wentzler group (also run by Mel!) January is animals, April is nature & both of those would match Tapestry Cat. 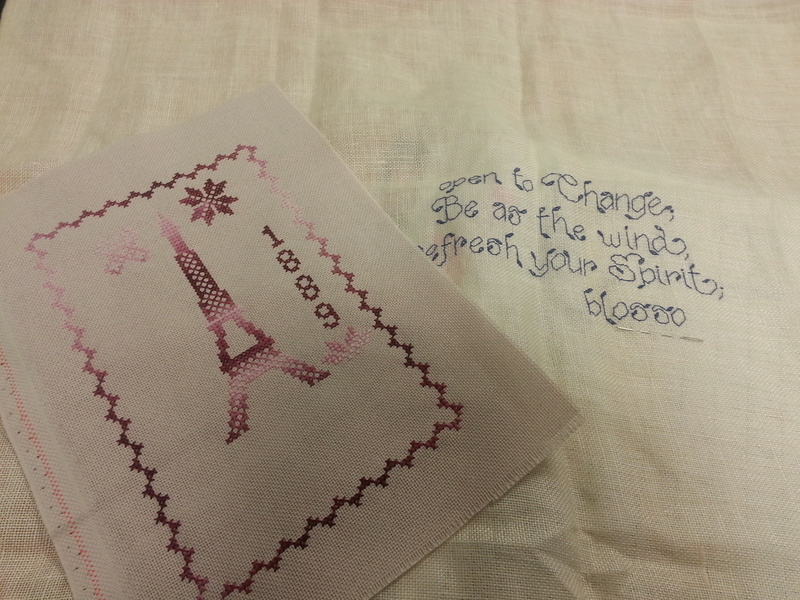 I’m taking the two-monthly Jane Austen SAL and I’m going to mix & match different pieces to make a unique sampler of quotes & icons. More on this in the next update! Mirabilia Persephone (May 2015) –because I want to get thru that skirt! I’m going to try to limit my purchases also. Any planned stuff must come from a local supplier, no more overseas blitzes! I’m also pulling out of an international sales group (most participants wouldn’t post to NZ in any case) & removing myself from mailing lists. Wish me luck! This is my second-oldest WIP; I have the original kit edition! 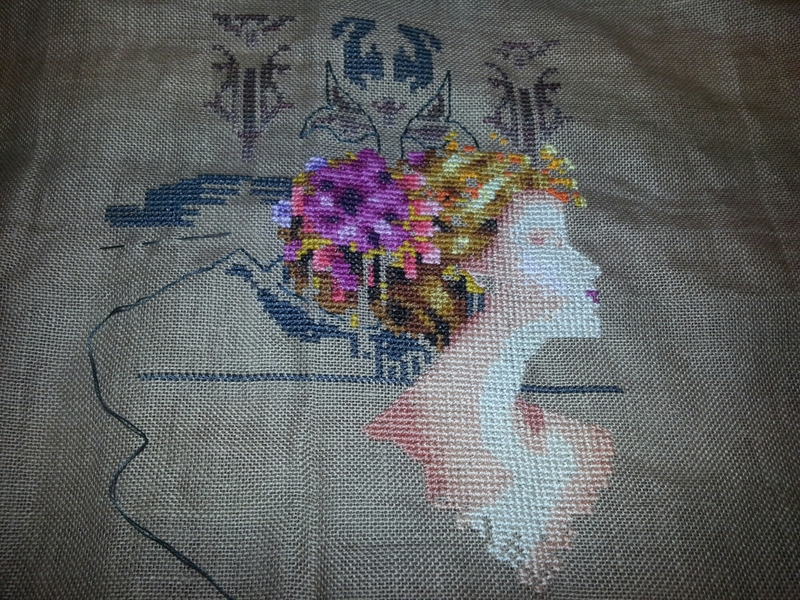 Maybe I should get it on the large frame as soon as I finish Persephone…and NOT start another Mira! I’m getting back on track! I’ve stitched every night from Sunday thru to Tuesday and feel like I’ve achieved a level of nirvana. TC has gone away again. There is just so much exciting stuff on the telly that I found I was constantly frogging as I want paying attention. However I did get over 1000 stitches in a very short space of time. Roll on summer and the cricket! Lots of counting and recounting (waterlillies are so expensive here) but I can stitch and watch New Zealand beat Australia AND Jamaica at the netball with minimal frogging! February 4 – Topic: How do you overcome that feeling that you’re in a rut with a particular project? Right. Onto the hard stuff already, Melissa? Meanie. In all honesty, I don’t do rut treatments very well. In the past, they’ve just gone into the UFO pile (altho there is actually only four pieces in that pile). I tend to fad about a piece and LOVE IT SOOO MUCH that it has to be finished, right then & there. Mostly, my 2014 choices reflect that. I got a heap of stuff completed & only left two major starts unfinished. One, because it’s my “hospital” piece – Mirabilia’s Mediterranean Mermaid – & I only work on it when Mase is hospitalised. The other – for some reason I got discouraged with Stargazer. I think it’s her hands – they look so awkward. However, for all that gloating, I didn’t touch Teresa Wentzler’s Tapestry Cat. At All. Not even to get it out of the storage container it lives in. 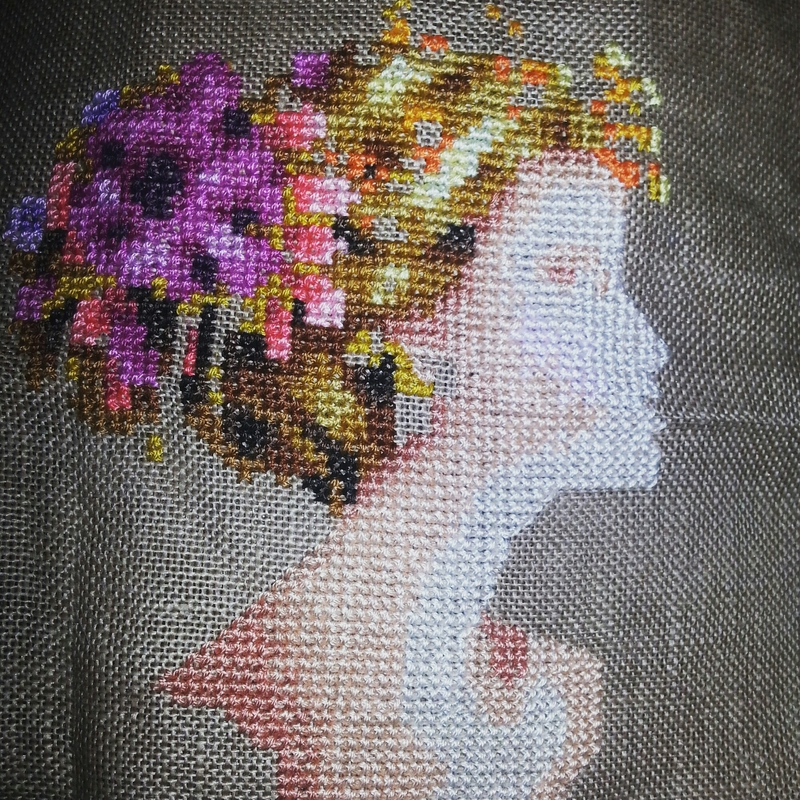 I think it must be the perceived difficulty & fiddly bits – I love the image and the colours and the work I’ve done so far. I know that if I just pull it out, and start stitching, I’ll fall back in love with it – after all, that’s worked with Stargazer. She languished for about four months until I packed her, and only her, as my “entertainment” for our family holiday early in January. Since then, I’ve worked almost exclusively on her. I guess forcing myself on something makes me appreciate it. Like doing the dishes – a clean kitchen is a beautiful thing. Or laundry – folded piles & clothes on hangers almost make it worth the repetition. Second is about three hours of lettering – I am not in love with lettering at the best of times – of the Joan Elliot SAL (26ct cream Linen, lettering changed to DMC 311 as black looks too harsh). I also need to have this done over the weekend. Then I need to suss something out for Si. Perhaps something English? Help!